Self-sufficient, family traveling to see the country and meet people. We really enjoyed our stay with this family. They were very laid back and very helpful with information on our travels to Disney in Florida. We really enjoyed talking with them. They were sweet enough to bring out one of their bounce houses for our toddler to play in with their wonderful kids as well as their kids riding toys. It was great to have the kids all play together. Their dog is one of the best behaved and sweetest dogs I have ever met! 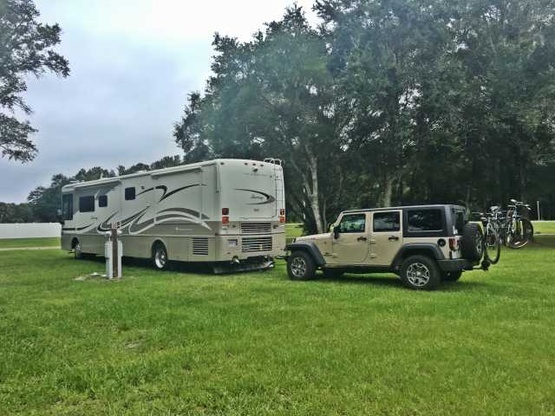 We had plenty of space for our 39 foot fifth wheel and a spot for our 5 dogs fenced in area. It didn't feel cramped at all. We were able to enjoy the beautiful area when we went to visit the prison they shot Shawshank redemption at and enjoyed some Amish deserts. We look forward to staying again next time we pass through this area! We really enjoyed our stay with this family. They were very hospitable and laid back and even allowed us to stay an extra night when we were in a pinch. Our son had so much fun playing with the boys. They own a bouncy house franchise- need we say more?! Thank you and we can't wait to come back to visit with our new friends! This was our first time as guests, needed a place to stop for the night. They were very accommodating and responded quickly with texts to guide us to the proper way in. Spot is very nice shaded blacktop with electric and water. LKS were great hosts. We enjoyed getting to know them, and what they are all about. We came as strangers and left as friends. We shared some Keto receipes, and had a lot to talk about. We really enjoyed our time here. We would definitely drop in again. This was our very first Boondockers Welcome visit. Our hosts invited us to grill out and share dinner with them. They were very generous with their accommodations and thus, have set the bar high for subsequent BW experiences. We stumbled across this wonderful family when we failed to make advance campground reservations for Memorial Day Weekend. Sometimes things really work out for the best. The property is quite expansive. Entry to the designated space (50 amp and H20) is via a circular drive and the owner will be available to direct you around one tight corner (we are in a 45' Class A.) 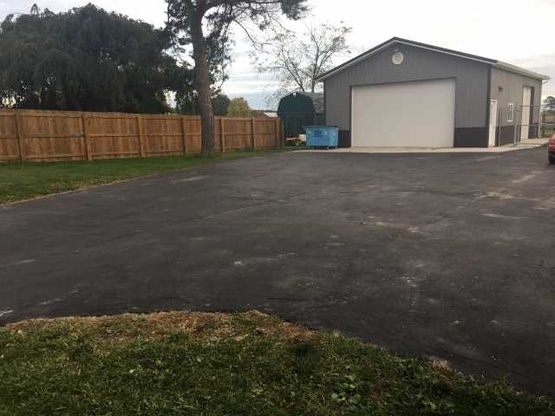 The lot is paved and level. Due to a small mechanical, we asked to stay an additional day. No problem at all and with the host's mechanical skills (and his tools and hardware) we able to make a very good fix and be on our way the next day. Larry and Kristin are very welcoming hosts. We stopped the night and we're very excited to learn through theit last guest reference that we could do a.tour of the prison where the movie "Shawshank Redemption" was filmed. Very level large spot for our rig. On a busier road but that didn't stop us from having a restful night. Thank you for being our hosts. This family is not only friendly they are highly accommodating and very resourceful. We enjoyed our time with Lance, Kristin, Christopher, Mathew and Kaiser immensely. Our children loved playing with their children and we loved our time chatting with both Lance and Kristin. We explored the prison where Shawshank redemption was filmed, ate at local Mennonite markets and purchased all natural bug spray oil from a local vendor. It was an amazing visit and we are very happy we stopped in.